Good thing this is practice wool. And most important, I ended up with a skein that was seriously unbalanced (with a S-twist), which was a first. In reading about that, there are a several possible causes. One is overplying, another is different amounts of spin on the singles (which I had), and another is when the spin goes “dormant” on singles that have sat around for a while. And the oldest of the three bobbins, which also had the least amount of spin, did sit for a WHILE. So if the spin goes dormant, soaking will help “wake it up” – and after I soaked it, the yarn was much more balanced. So I suspect that that was in fact my problem. It’s hanging to dry now. So now I’ve moved on to the new wool, I’ll call it H57 for short, since the label says it’s “Heinz 57”. Happily, all the skill I’ve gained so far carried over. H57 feels slipperier than the Blue Leicester, and I can definitely appreciate that it’s been combed. The BL had irritating little curlicues of fiber that this wool does not have. 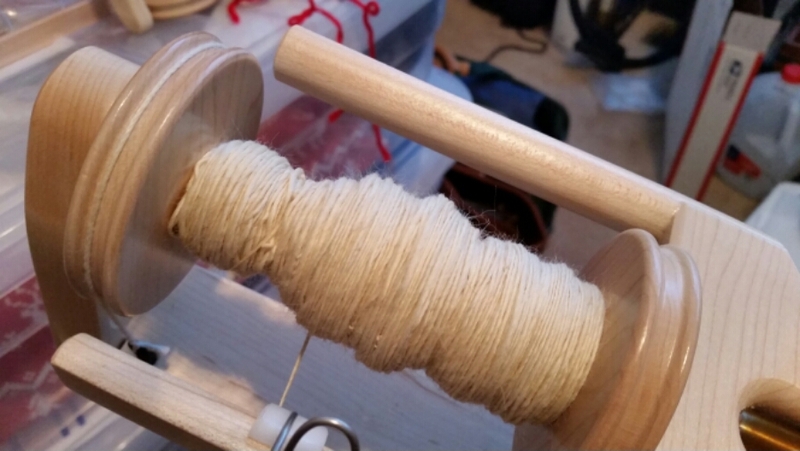 It looks different, too – on the bobbin it is completely matte – no lustre at all.